Even here, the Alfa 6 isn't common. Introduced in 1979, it was the precursor to the 164. The name came from the engine, a 2.5 6-cylinder, later to be found in the GTV6 and the Milano. Later in the production it was available with a 2.0 6-cylinder or a 2.5 5-cylinder turbo diesel. Despite the elegant styling, the numerous standard features and the competitive price, the 6 never caught on and sales figures were small. This series II 6 was seen in Rome. Here is a good example of the 500 Giardiniera I mentioned in the last post. This particularly nice example was parked in Rome last year. From the B-pillar forward it's identical to a 500 berlina but the back is shaped different which helps it accomodate passengers with greater ease. It also solves one of the 500's biggest problem: luggage room, or lack thereof. The engine is rear mounted so the berlina's trunk space is limited to the front compartment which also has the gas tank and the spare tire. By mounting the engine vertically they were able to clear up a fair amount of trunkspace. Fiat also used this approach in the 126 when they replaced it with the 126 Bis. Worth nothing, this is an early model that still has suicide doors. While they look different, these two cars share the same drivetrain and were launched in the same year. The Autobianchi Bianchina was designed as a more upscale Fiat 500. Unlike the 500 which was only available in the standard sedan you see here and a Giardiniera van, the Bianchina was available in a whole variety of models including the Panoramica (pictured above), Furgoncino (a little van of sorts), Berlina (standard sedan), Trasformabile (think Citroen C3 Pluriel) and Cabriolet (convertible). They were all powered by the 500's air cooled flat 2. The displacement was either 479cc or 499cc, depending on the model. These two were sitting in a supermarket parking lot in Sicily and didn't move the entire time I was there. The 500 was wrecked. 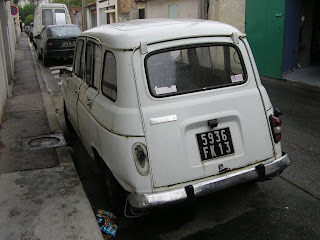 Not visible from the street, this 1974 Renault 4 is sitting in Marignane, France.. in my own backyard. I got it almost two years ago from a good family friend who kept it as his shop as parts storage. He closed his shop and gave me the car. I got it running last summer but it didn't run very well. I parked it due to a dead starter motor. It also has electrical issues and is starting to get quite rusty. I initially had vague plans of fixing it up but with arrival of a 1969 R4, this car has sadly become an organ donor and for a while now it's been back to its old vocation, parts storage. I have loved Renault 4s for as long as I can remember and I'm very attached to this one, being my first one, and parts car or not, I don't have the heart to fully part it out and junk it so it's not going anywhere anytime soon. This pair of Fiats (1100 and 850 Coupe) is sitting in Barcellona, Sicily. They're rusty and beat up and are probably parts cars at best. There's consolation in the fact that the same household had a nice GT Junior and a nice 850 Coupe up on the street. Still in the same town and only a couple of streets over, this 850 Spider ("il Spiderino") is parked outside an apartment complex. It's not in bad shape and looks like it could easily run again. It appears to be a snowplow. It's sitting near the top of Etna and is powered by not one but two four cylinder turbo diesel engines, mounted side by side and both cooled by a single radiator the size of a dinner table. I didn't find any ID tags on it that would indicate just what the hell it actually is, who it's made by, etc. Interestingly enough, not only did it have two engines, it had two sets of commands in the cabin, one facing forward, one backwards. I realize that some of the pictures we put up on this site aren't clickable. I don't know what that's attributed to, I used to think it had to do with the size of the photos but I don't think that's the case. At any rate, if you want the high resolution of any photo you see on here, just make yourself known and we'll send it/them to you. "This car will be impounded if not removed in three days"
Ah, you never forget your first car. I was 15 and in love with Saabs. I found out a friend of mine's uncle had one sitting on the side of his house, a 1984 900 S. I don't remember the full history of it but the gist of it was that it hadn't been registered in years and was mainly driven around his lot (they owned a farm) by kids and grandkids so it had a lot of dings and dents. Today I'd run away from this car but as a 15 year old eager to get his first car, I jumped at the opportunity. I talked to them about it and they ended up giving it to me. Problem #1: for people familiar with the Salt Lake area, this was in Highland, Utah. Not very far from Salt Lake City but not very close either. Another friend of mine's dad had a Dodge Ram and we rented a trailer from U-Haul and towed it back. Problem #2: once again for people familiar with area, I lived on 4th Avenue back then, not much room for a car. 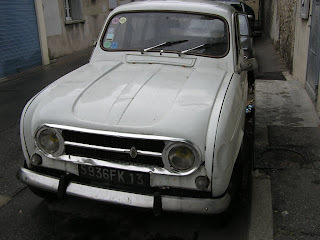 I got it towed to a friend's house and much to his parents' chagrin left it there for the summer while I was in France. Problem #3: I got it started with a jump from a Toyota truck, drove it and couldn't get it to go out of 1st gear. At 15 I didn't have the time, knowledge or resources to really do anything about a bad automatic transmission so I started to part it out before my friends' parents got angry and wanted it gone. What to do, what to do? Well, I parked it on the street in front of their house and since it had no plates, it didn't take long for the SLC Police Department to get interested in it. I started getting tickets and later impound notices and it eventually got taken away. I unfortunately don't have any other photos of it, just this one, taken a day before it was impounded. Parts from it went on subsequent Saabs and I still have some in the garage. A GS 1220 Club. The plate puts it in the 1975-1976 range. The cancer on the trunklid and the numerous dents are a testament to the hard life this car has probably had. I believe that blue color to be original, though it's obviously faded. The GS was introduced in 1970 and was designed to slot in between the smaller Ami8 and the DS. It won the European Car of the Year for 1971. It was powered by a series of anemic, though simple, air cooled flat 4s. The exception to that was GS Birotor which featured a rotary engine developed by Citroen and Wankel. Less than 1,000 of them were built and they are very rare today (see Avignon photos for one). Thanks to the Hydropneumatic suspension that was made famous by the DS, it had a better ride than any car in its class and ended up selling quite well. It was replaced by the GSA in 1979 but it was essentially identical to the GS. The body was the same but it now had a hatchback. Other minor differences include taillights, wheels, and bumpers. While they're by no means common, they're not rare either and they are unfortunately not worth very much so a decent example can be had for around €1,000-€1,500. A personal note-- I own a 2CV and a GSA and my cousin owns a DS. The GS drives like a faster 2CV and rides like a DS, it's the best of both worlds. This engine-less Piaggio Ape is ending its days in Barcellona, Sicily. The Ape was essentially a three wheeled Vespa and immediately became a hit after its launch in, correct me if I'm wrong, 1948. It was loved by small merchants of all kinds for its versatility and economy. It initially featured the Vespa's 50cc monocylinder but over the years it's been available with all sorts of engines, including a diesel. The Ape (which means "bee" in Italian, nothing to do with a primate) is still in production today and one can acquire a new example for about €3,000. The mystery car is a four door Fiat 128 which one can identify by the door handles or the plate in the engine bay. As for what happened to it, I have no idea. And, this Fiat 125 was sitting down the field from it. This one appears to have suffered from an engine fire. I took both photos about an hour outside of Messina, Sicily. Who's to say that RWP only applies to cars? This 1970s era Piaggio Vespa is sitting near Taormina in Sicily. Featuring a 50cc monocylinder engine, scooters like this one are still a very common sight in Italy. Great for getting around in tight traffic, good on gas and quite fun to ride, I can see why. Dying between State College and Bellefonte, PA in a very rural wooded area is this sorry old 900. This 4-door turbo would appear to be a circa 1985 model, having the flat-front and "turbine" wheels. The old style PA plate would indicate (along with the bird crap, tree sap, and overall condition of the car) that it hasn't been on the road in at least a decade. It would seem likely that this car was purchased used (from a Chevy dealer judging by the plate surround) and probably suffered some sort of debilitating internal failure which was either too expensive to fix or untraceable and not worth the time and effort. At this point it's probably just a good candidate for parting out. Just a few more from the show. Anybody in England missing their 190E? This apparently stolen 190E is ending its days in the French countryside.. as good a place as any, I suppose. It's a RHD car registered in England and interestingly enough, unlike most other stolen cars here, it hasn't been set on fire yet. A couple more pictures from Avignon.